How has the growing trend of global financial data localization laws affected financial institutions handling difficult questions of data privacy? What have been the practical impacts of these laws? 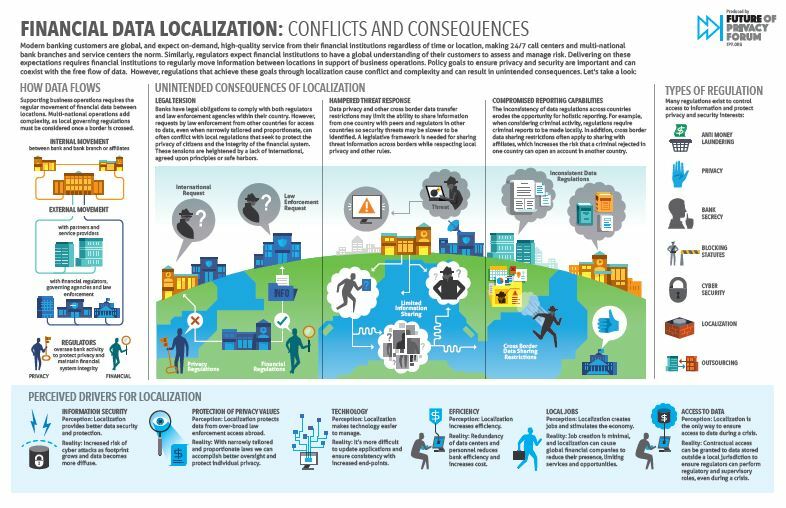 FPF addresses these questions in a new info-graphic: “Financial Data Localization: Conflicts and Consequences” (view the info-graphic here) (Pdf). Financial Data Localization: Conflicts and Consequences explores the perceived drivers as well as the potential unintended consequences of the growing trend of global data localization laws. Data localization laws, which require data about a country’s residents be processed or stored inside the geographical boundaries of a country, are often perceived as a way to protect privacy, stimulate a local economy, or maintain national control over data and technology, among other motivations. Despite the importance of these goals, there may be better ways to safeguard privacy and protect individuals’ financial data (for example, through narrowly tailored and proportionate law enforcement access requests) while avoiding unintended consequences. This info-graphic highlights three ways in which such laws may lead to unintended results: First, legal tension is often created by banks’ conflicting obligations to comply with local privacy laws and international law enforcement requests; second, threat responses may be hampered by cross-border data transfer restrictions that limit banks’ abilities to share security threats from one country to another; and finally, banks’ reporting abilities may be compromised by regulations that restrict cross border data transfer and regulations that require criminal reports to be made locally, increasing the risk that a criminal rejected in one country can open an account in another country. As more countries consider data localization laws, these issues will continue to grow in importance. Recently, for example, the Brazilian Central Bank proposed cybersecurity regulations that would prohibit financial institutions from using data processing and cloud computing services based abroad. According to some, regulations such as these could have negative implications for banks and consumers, including raising the costs of effective fraud detection. As U.S. financial institutions grapple with these difficult questions, we hope that this info-graphic will contribute to the growing conversation around data localization laws and how best to protect privacy and security internationally. Click to view full info-graphic (PDF).